"Even more recent trumpet/cornet players seem to have emulated Bolden’s general approach in their sound: Wingie Manone in the 1930s, P. T. Stanton in the 1950s, and even Clint Baker today, seem to be possessed by the spirit of Bolden’s brash, rough, blues-for-dancing, stomp, and slow drag lead horn that heralded a new music nearly a century ago." "The revival rolls on, ever producing new musicians who will make a lifelong study of hot jazz ensemble part-playing. 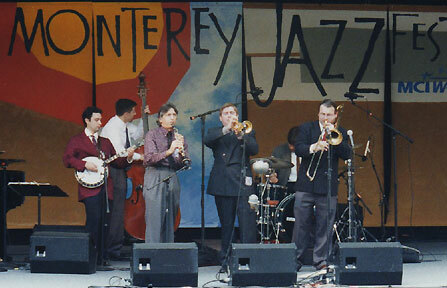 Just as star performers regularly emerged from traditional jazz over the decades – Australia's Bob Barnard (trumpet), England's Roy Williams (trombone), Scotland's Sandy Brown (clarinet), America's Bob Helm (clarinet), and Sweden's Bent Persson (trumpet) are a few – so the new century will have it's creative luminaries. Californian multi-instrumentalist Clint Baker, a born jazz naturalist, is one such young, inventive player. "Sunday afternoon used to be relatively slow at Monterey with lots of high school bands, but now the teenagers only dominate two of the five venues. 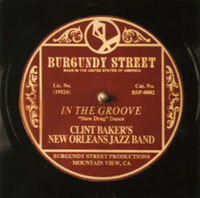 The music resumed with a strong dose of "the real jazz," New Orleans jazz as played by Clint Baker's band. Baker, who was heard on bass at the Sweet and Hot Jazz Festival (he and Bill Berry were the only two musicians heard at both that event and at Monterey this year) led his group (which included trumpeter Marc Caparone and clarinetist Tom Sharpsteen) on trombone. The ensembles were exciting (particularly on "Panama") and the version of "Exactly Like You" (with Baker taking a good-humored vocal) was a classic. 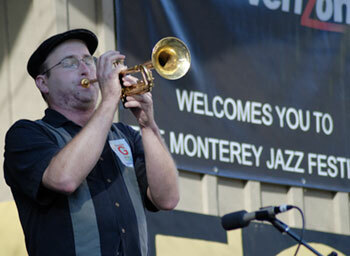 The audience loved the band's spirit, making one happy that Monterey finally had some trad jazz on Sunday afternoons." Clint Baker is one of the few musicians to lead a Traditional Jazz Band at the world renown Monterey Jazz Festival joining the ranks of Louis Armstrong, Punch Miller, and Jack Teagarden. 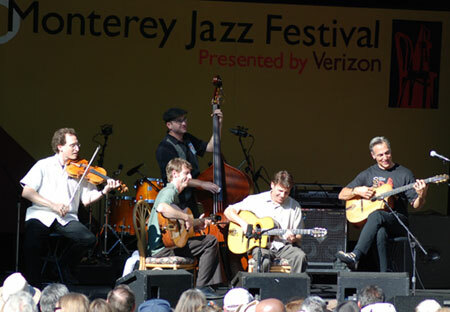 Clint appeared with the Hot Club of San Francisco at the Monterey Jazz Festival for a second time in 2007. It was the 50 Year Anniversary of the Festival and this was the first time in the festivals history that a Gypsy Jazz Band was invited to perform. "And there are always serendipitous moments—dropping by a stage, not knowing who's playing and then being rewarded beyond expectations. For instance, we looked in on the Gallery and were stopped short by Smith Dobson, a new voice on vibes who swept up the listener into his lush textures and exotic bossa nova rhythms. Another time, music coming from the Garden Stage sounded like a reunion of the ghosts of guitarist Django Reinhardt and violinist Stephane Grappelli. Hurrying toward the sound, we arrived in time to discover the Hot Club of San Francisco—a reincarnation of le Hot Club de France from over 50 years ago." Gypsy jazz band the Hot Club of San Francisco joins us in the studio to perform songs from their new holiday album, "Cool Yule," as well as other swinging selections. We also explore the life of gypsy jazz pioneer Django Rhinehardt, the great guitarist who gained fame in the jazz clubs of Paris in the 1930s. 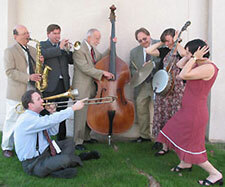 Link to the Hot Club of San Francisco Website here. 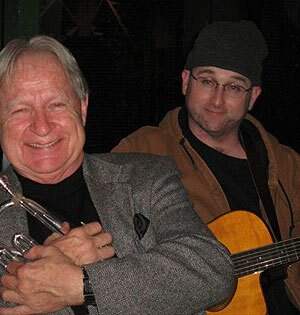 Clint has been leading a New Orleans band at Cafe Borrone in Menlo Park for over 16 years. 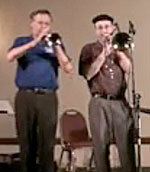 His regular trumpet player for the past 8 years has been Leon Oakley. 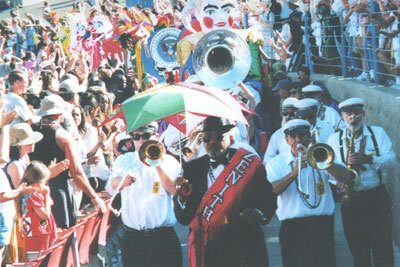 Leon is known for having worked with Turk Murphy, The South Frisco Jazz Band, and Bob Helm. He also currently plays with the Yerba Buena Stompers along with Clint. Leon and Clint are both avid garden railroaders. For info on the Cafe Borrone All-Stars click here. For info on Clint's Garden Railroad click here. "Clint Baker’s NEW New Orleans Jazz Band nailed the magic formula for high energy exuberance. Clint plays many instruments well, but his work on the trombone in this band seems to fit him best." 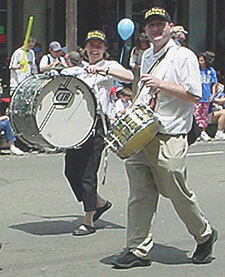 Clint Baker has been a bandleader since 1984. He produced his first record in 1991. Since then, he has produced 7 recordings including "In The Groove", "Going Huge", and "Tears". "I met (Clint) at a music party sometime in the summer of 1989, and at 17, he was a kind of boy-wonder of vintage jazz. All of us (at the time) thirtysomethings were very impressed by him and his talent and knowledge in the field of vintage jazz, and continued to be as we saw him draw an inner circle of then-teenage disciples, work with them when we subbed in with Bill Armstrong's Churchill Street Jazz Band (where I got my start as a teenager myself), and then saw them go on to bigger and better things. I remember Robert Barics played with Wynton Marsalis for a while, and Clint started his own band, implementing his take on the New Orleans genesis of Jazz, and become active on the festival circuit. "As one looks at the tapestry of Traditional Jazz, and the networks of people who form the different generations, Clint should be seen as an important link to his generation. Probably the fourth generation. "The first would be the pioneers: from Buddy Bolden to Armstrong, Oliver, ODJB, Morton, Morgan, NORK and Beiderbecke. 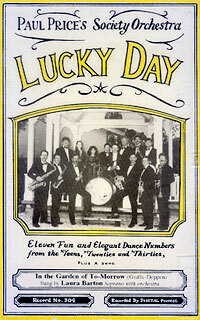 The second would be Lu Watters and Turk Murphy on the West Coast, and Eddie Condon and fellow travelers on the East Coast, many of whom were first-generation veterans, all playing some kind of Dixieland around 1940 or so. The third would be those born around then, from say Leon Oakley, to the guys my age who have been the festival bands in the last 20-30 years. Many of us baby-boomers. Clint is a generation X'er, and he is an important link to the fourth generation. Wynton Marsalis is I think technically a baby-boomer, but really I would put him in with Clint's generation. "What I think is the current shape of things now versus circa 1980, and that I first noticed with Clint locally and Marsalis nationally, is they have always had a boldness to unapologetically play this old music. If they say it's cool, it's cool." Clint Baker has performed at the Sacramento Jazz Jubilee every year since 1988. Fifteen years he's appeared leading his own band, and seven years he performed as a sideman. This year will mark his 24th year at the festival! He will be perfoming with Hal Smith's International Sextet. CLICK HERE for a complete history of Clint at the Sacramento Festival! 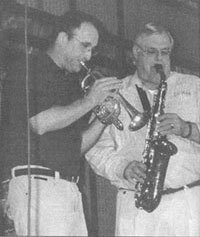 In the 1998 Mississippi Rag Trad Jazz and Ragtime Poll, readers voted Clint Baker's Jazz Band one of their top five Favorite New (Emerging) Jazz Bands. Clint Baker was voted one of their top three Favorite New (Emerging) Musicians. "In The Gutter With the International Jazz Band of 1997"
"With an excellent rhythm section featuring Pat Hawes's educated and inventive piano, Dave Brennan's light-fingered steadiness, the huge sound of Tuba Fats from New Orleans and the lively drumming of Clint Baker, the band made a great reputation for itself around Europe." "Dave Brennan is the epitome of tact and supportiveness and the young American Clint Baker provides a lively and imaginative bottom end, while Tuba Fats shows that the long New Orleans tradition of brass band rhythm is still in good hands." "Clint Baker on drums is excellent throughout. He listens to what's happening around him and does the right things in the right places always providing good time keeping and a generous dose of excitement." "While Clint Baker is a name that is new to me, as are so many of the musicians I have encountered on Big Bill's Jazz Crusade record label, he's got the New Orleans Paul Barbarin style down to a T."
"Your mama raised you right."